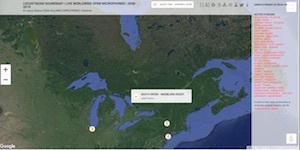 The rural soundscape of Warbler’s Roost has joined the “Open Microphone” network of soundscape broadcast streams at Locusonus. I encourage you to explore their sound map of live streams from around the world. My contribution is an element of a larger research project called The Absent Listener. The goal of which is to build a portable soundscape streaming and compositional tool for creating a long form soundscape composition. My research project is funded by the Canada Council for the Arts. The soundscape from Warbler’s Roost is best characterized as a northern rural soundscape. This winter has had more snow than usual. There are a number of rabbit and red squirrel tracks around the area of the microphone. Ravens often fly overhead. Currently the location is near one of the houses, so there will be some residual human noises until I am able to build an off the grid power solution. Where there is power, there will be people. … while working and walking, River Valley Snapshots, and Bats & Elephants. Many thanks to empreintes DIGITALes, the Canada Council for the Arts, and the Ontario Arts Council for their generous support. Also, I am grateful to Hector Centeno and Matt Miller for their specialized assistance through the unique recording process undertaken for this downloadable album. My audio recording of Moose during mating season is available on Radio Aporee. Radio Aporee is a great resource for exploring soundscapes from around the world. This recording was recorded at Warbler’s Roost. More soundscape recordings can be heard at Warbler’s Roost. Creating a new fixed media piece for the Now Hear This! Festival in Edmonton. Some updates on the Ultrasonicmobile performance system. Fishing for Sounds installation on exhibit at White Water Gallery in North Bay, Ontario. Living in a rural soundscape allows for more space for listening to the natural soundscape. There are some examples of recordings that have been made at my home on the Warbler’s Roost webpage. You can listen to a recent example of my research into ultrasonic recording using the MEMS ultrasonic microphone array by Dodotronic along with a customized software and hardware for real-time transposition which is designed by Hector Centeno. 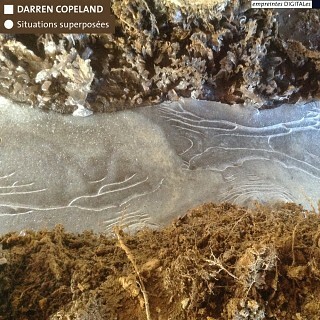 Darren Copeland is doing a senior production artist residency at Paved Arts. While in Saskatoon he has been creating a new piece for the Sounds Like Festival to be premiered on July 26. His new piece called Three Places combines soundscape recordings from Toronto, Sarnia and Brampton. It also integrates his multichannel spatialization with the Audio Spotlight directional speaker. Sounds Like has a fantastic line up of artists for the festival taking place – you can read about it on their tumbler page. Darren Copeland, Matt Miller, and Hector Centeno performed Darren Copeland’s piece Underwater Soundspin which was performed using 3 Audio Spotlight directional speakers in an outdoor parking space. The performance was part of Art Spin, a unique performance and art tour where the audience cycles from location to location experiencing site-specific artworks planned as part of the tour. See the photo reel on their website for details. Copeland+Kahre unveil their new outdoor sound sculpture SIT/COM at the CAFKA Contemporary Art Forum from May 31 to June 29 in Victoria Park in Kitchener. This also coincides with the Open Ears festival. SIT/COM is an interactive audio installation sited at the nexus between social and natural acoustic space. The work is an extension of the artists’ ongoing research in acoustic ecology and collaborative practice of works that engage the effects of human development on the acoustic environment, particularly on the underwater domain. SIT/COM uses tactile speaker technology to create an immersive experience of human and non-human soundscapes, centered around a sculptural object that acts as a sonic hub. The work uses underwater recordings from the Grand River as a matrix for human interactions that are recorded and reconfigured by the software component of the work. The ‘bench’ is a sinuous sculptural object that reflects the shape of the river and offers a number of ways to engage with the acoustic environment. To learn more about the team of Copeland+Kahre visit their website. On Jan 31 in New York City at Harvestworks studio Darren Copeland will present a performance/talk detailing spatialization practices that have been undertaken at New Adventures in Sound Art (NAISA) in Toronto since 1998. Through performing his own works and works by other Canadian artists, he will demonstrate and discuss two contrasting approaches to performance spatialization used by NAISA. For more info go to the Harvestworks website.